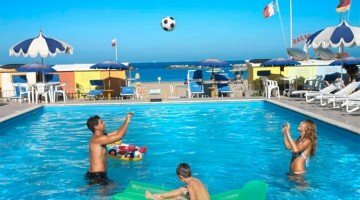 The Hotel Italia , 3 stars superior of Igea Marina, has: swimming pool that directly faces the beach, different types of comfortable rooms, private parking and free parking spaces, wine bar. 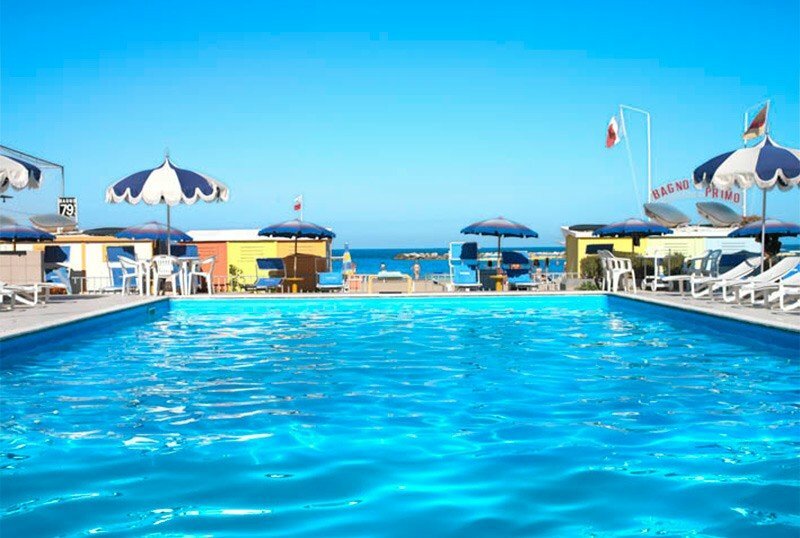 The hotel is on the seafront of Igea Marina: across the street you are already on the beach. In a few steps you reach the center of Igea with the pedestrian areas, and the Parco del Gelso. The hotel offers different types of rooms, almost all with balcony. All rooms have air conditioning, direct dial telephone, safe, satellite TV and minibar. COMFORT : these are rooms with sommier beds, bathroom with shower and hairdryer. By choosing this room you are entitled to parking space and courtesy set. SUITES : large double bed, living room, two balconies with sea view, 2 LCD satellite TV, WI-FI, rich courtesy set, bathrobe and slippers. By choosing this room you are entitled to reserved parking, drinks from the minibar, beach basket with beach towels, 2 sun loungers and 1 umbrella in the front row. Beer is also included in the price. PANORAMA JUNIOR SUITE : 2 terraces with sea view, 2 LCD TVs, large bathroom with shower. Choosing this room, moreover, you have available: parking space, courtesy set, use of the internet point. COMFORT FAMILY : two connecting rooms, each one has: bathroom with shower and hairdryer, satellite TV, sommier beds, balcony. By choosing this room you are entitled to: parking space, courtesy set. SUPERIOR : the room has sommier beds, a large bathroom with shower and a nice balcony. By choosing this room you are entitled to parking space, courtesy set. Swimming pool overlooking the beach, free use of bicycles, equipped open-air porch, 24 hour reception, reading room, elevator, luggage storage, transfer service. PARKING : scopero and available for everyone in the hotel; fenced and video surveillance at 300 m.
AIR CONDITIONING : common areas and air-conditioned rooms. LUNCH AND DINNER : three-choice menu accompanied by buffet with appetizers and vegetables. Drinks with meals, except beer, are always included in all treatments. In the hotel : play room, strollers. Pediatrician on request. In the room : cots and side rails. At meals : high chairs, kitchenette to prepare baby food, homogenized. The hotel has a large swimming pool overlooking the beach, available from April to September. Equipped with a solarium area, it is also ideal for children. Opposite the hotel is the beah affiliated with the hotel, the bathroom 80, which offers many services including: entertainment for children, WI-FI, sports fields, fitness area and much more. List prices are per person per day in Full Board for a min. of 3 nights. - To confirm the reservation we ask for the sending of the deposit, which, in case of cancellation, will not be returned, but may be sold to third parties or used within the following summer.